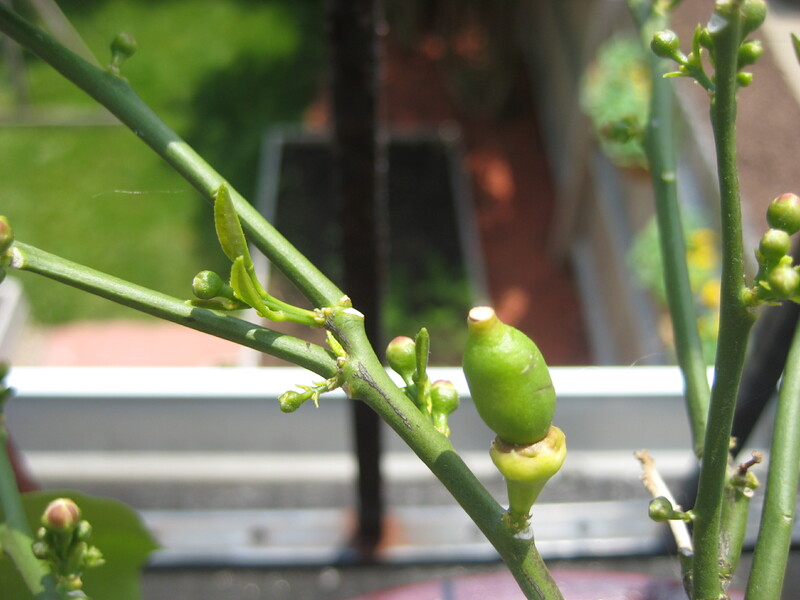 My little lemon tree has been undergoing some significant changes the last few weeks. Shortly after I repotted, my family and I became convinced we had a dead animal under our deck. Something reeked! Really bad! 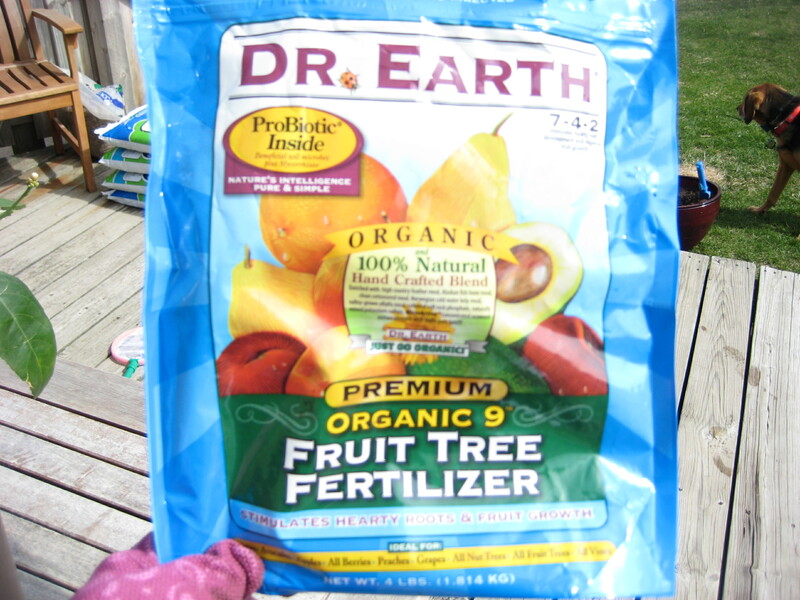 It took me a couple of weeks to realize that the Dr. Earth Organic Fertilizer was creating the stench. It seemed to be worse when I watered the tree. It was unbearable. We discussed repotting or even giving up on the tree and getting rid of it. The smell was coming in the house and had permeated the deck wood so there was no relief even when the pot was moved. In a last-ditch effort to keep the tree we moved it to our roof. We have an open balcony up there that gets full sun. We put it up there and happily ignored the tree for weeks. Eventually the smell faded and now–in the latter half of June–I can report that I don’t smell dead animals anymore. I went up to visit the tree a few days ago. That little tree has set fruit and grown leaves! It looks so much healthier. I am amazed at the change. 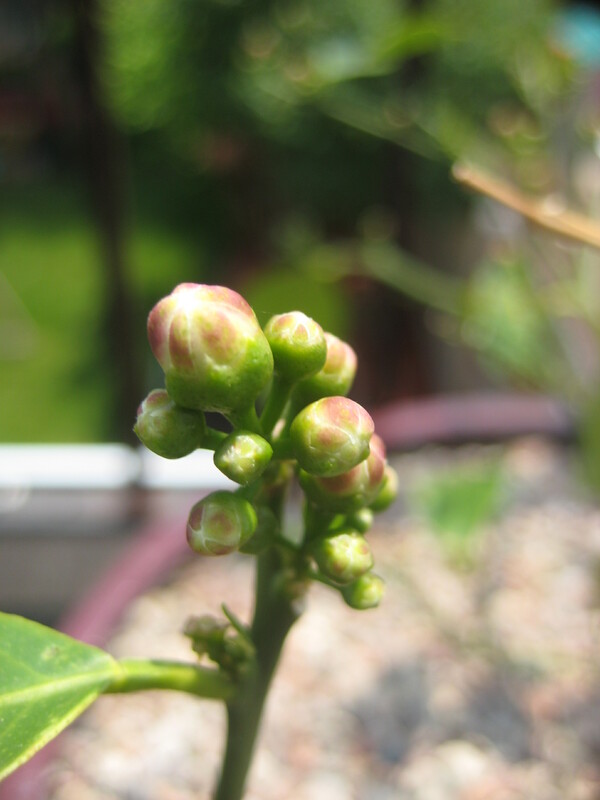 New buds on the dwarf meyer lemon tree. Leaves have returned to the lemon tree. I didn't notice the fly in this photo until now! This tree must also be attracting pollinators such as bees which is contributing to its health. All that sunshine is doing it good. And I think that it likes to be left alone. After a winter of being misted, watered, stared at, etc, it seems to enjoy the peace and quiet of the roof and the endless summer sunshine to bask in. And really, that shouldn’t be a surprise. 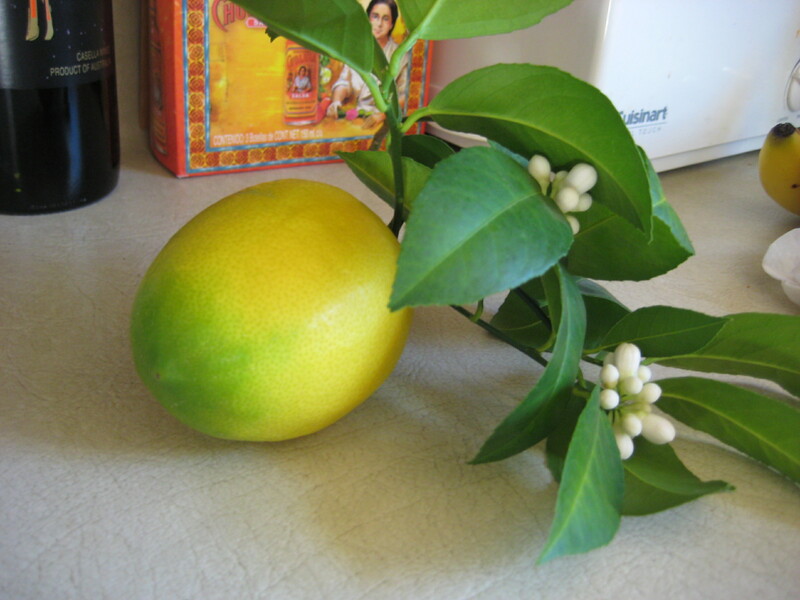 Lemon trees are at home in a tropical climate. Wisconsin is a foreign land to a lemon tree. The roof is hot and sunny, the summer sun is abundant, and the humidity is just what the doctor ordered. I don’t know what I’ll do in the fall. If the plant still smells I won’t be able to bring it in the house. I don’t have an outdoor area for overwintering plants that would be suitable for citrus. I guess time will tell. For now, I’m happy the tree is doing better and even happier that it has fruit on it. Perhaps we’ll be enjoying lemons again soon. This is the one ripe lemon I've harvested from my lemon tree... this was back in October last year. 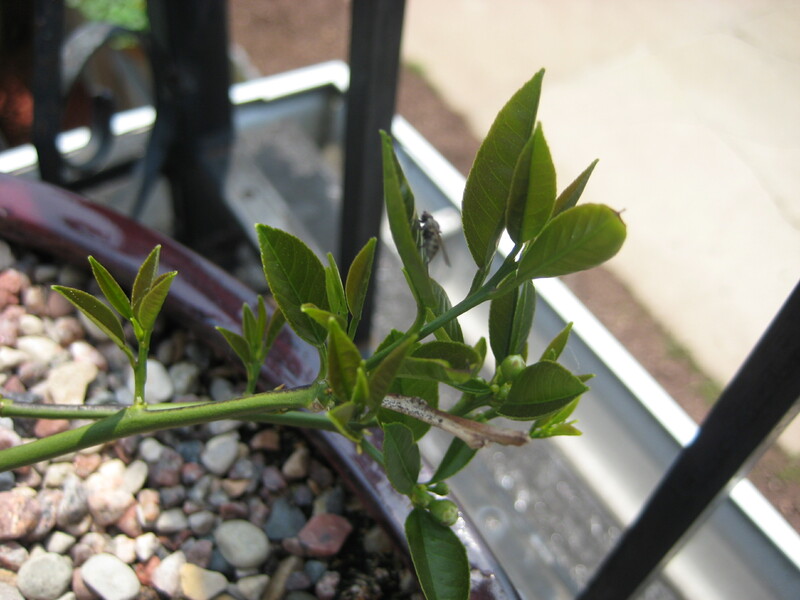 This entry was posted in Fruit and tagged dr. earth, dr. earth organic fruit fertilizer, dwarf meyer lemon tree, fruit fertilizer, growing citrus in Wisconsin, growing lemons in Wisconsin, indoor lemon tree, lemon tree, meyer lemon, organic fruit fertilizer, Wisconsin lemon tree. Bookmark the permalink. everything & everybody with that terrible B-0 it was reeking. and purpose for being. Got to be a lesson here someplace. from this most resilient plant.